When Rob McClanaghan failed to make the Syracuse basketball team as a walk-on freshman, he asked the coaches what he needed to do to achieve his goal the following year. They all agreed: get stronger. So that’s what he did. For months, Rob traded fraternity parties and hanging out with buddies for hours in the gym lifting weights and shooting baskets. He was single-minded; the only thing that mattered was defying the odds. He returned to Syracuse for his sophomore year thirty pounds heavier and caught the coach’s eye. In Net Work, McClanaghan—referred to by many as “RobMac”—brings to the page what he brings to each of his training sessions: the same grit and spirit that got him into the college game. He calls it “the grind,” and he knows that without it, even the most talented players will come up short. McClanaghan pushes his clients hard; he does whatever he can to drive his players to the edge and to simulate fourth quarter, at-the-buzzer adrenaline and fatigue. Rob McClanaghan is the premiere basketball trainer to the stars of the NBA. He lives in Rhode Island with his wife and their three children. 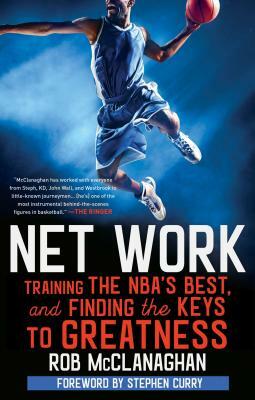 Net Work is his first book.